The company was directed to pay the fine amount to the Chief Minister’s Disaster Relief Fund. 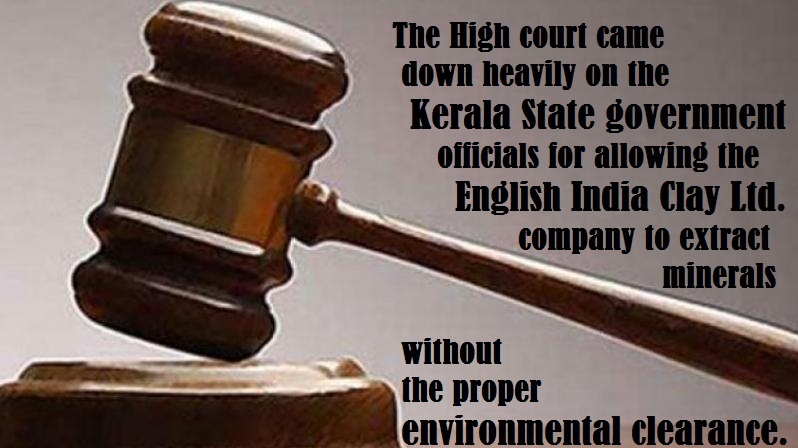 Kochi: The High Court has directed the state government to recover 100 percent value of the minerals extracted by English India Clays Ltd for undertaking mining without obtaining environmental clearance. A division bench of the court also imposed the Veli-based company in Thiruvananthapuram a fine of Rs 10 lakh on the grounds that the company had abused the process of law by carrying out illegal mining using on the interim order of the court. The court came down heavily on the state government officials for allowing the company to extract minerals without the proper environmental clearance. “The present case is a classic case in which illegal mining was allowed to be carried on by successive governments without care for the environment and ignoring the pleas of the local residents,” the division bench said. The court asked the company to pay 100 per cent value of the mineral extracted from the company quoting a Supreme Court judgment in a Common Cause case holding that extraction of any mineral without environmental clearance would amount to illegal or unlawful mining attracting provisions of section 25 of the Mines and Minerals (Development and Regulation Act) 1957. The court directed the government to constitute a committee headed by senior official deputed by the regional controller of mines to inspect the premises of the company and assess the illegal extraction of China clay to determine and recover 100 percent value of the extracted minerals. The court issued the order in a series of revision petitions filed by the company seeking police protection for carrying out mining and people opposing the mining by the company. The company also challenged the prohibitory orders passed by the mining company under the Paddy Land Act against China clay mining. 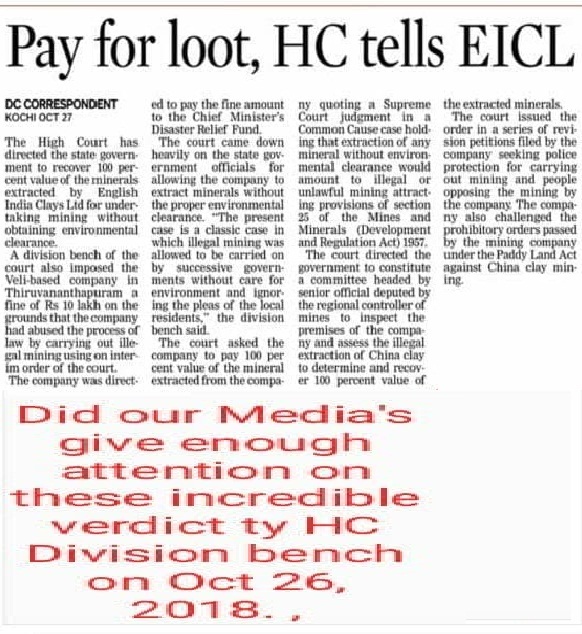 Published on Oct 29, 2018, 1:45 am, DECCAN CHRONICLE.